After all of the excitement and insanity of a highly unusual Masters that looked both old and new at the same time, Tom Watson brought it to a calm conclusion last Sunday on the Augusta National course by taking us on a tour of his golf bag over the late and crucial holes, those holes that make the best calendar art and are slowly etching Watson into the history of the Old South alongside generals Robert E. Lee and Stonewall Nicklaus. When it came down to winning his second Masters and his fifth major championship, Watson hit a variety of shots as beautifully as any human can hit them. This was the only way he could stave off the challenges of Jack Nicklaus, his co-star in the drama, and Johnny Miller, the best supporting player. Nobody gave Watson this Masters, as bizarre as some of its moments were. In the final hour he held on to a threadbare lead by playing brilliantly over water, out of sand and across a new set of greens that were slicker than the top of Sam Snead's head. The manic action of Saturday's third round had revived the Watson-Nicklaus Show that had previously played to smash-hit notices in Augusta, Ga. and Turnberry, Scotland and had left Watson with a one-stroke lead over Nicklaus with 18 holes to go. It was this lead Watson had to protect on Sunday, particularly over the last nine, where danger so often lurks and where the tournament is so often claimed or given away. He rammed home an assassin of an eight-footer for a par 3 at the tortuous 12th hole; he saved his par 5 at the 13th with the niftiest pitch shot anybody ever hit over a creek and under the circumstances; he birdied the par-5 15th with two putts after nailing as solid a four-wood into a breeze and over blue water as he has ever struck, the ball landing like a butterfly and settling into the fat part of the green; and he saved his par 4 at the 17th with a glorious bunker shot on the same hole and from the same sand that had done him in the day before. Happiness is knowing you can bogey the last hole and still win the Masters, but Watson was too much in control of his game to bogey the 18th at Augusta. He parred it by driving safely into the left center of the fairway, hitting an equally safe five-iron to the green and comfortably two-putting from 30 feet. When he raised his arms in victory, he had shot a one-under 71 for the day, and his eight-under total of 280 gave him a two-stroke edge over Nicklaus and Miller. "I was so nervous today, I was about to jump out of my skin," Watson said afterward. "But when nobody made a real strong run at me early, it helped me settle down and just try to play good golf shots." Many of Watson's fans might have been happier if he had been nervous enough to jump out of his Fila golf shirt, a model he has worn lately because of a lucrative contract. It's a shirt favored by people who fancy a skimpy, flat collar, and during the week Watson took some brutal kidding about it. "If you can win the Masters in those shirts," he was told, "it will be the greatest accomplishment since Jack won 19 majors." One of the fascinating aspects of the tournament is that Saturday got mixed up with Sunday. It was on Saturday that Nicklaus lost a four-shot lead on the field and Watson's name went to the top. All of this occurred in the most unlikely of ways, and all of it was done by Watson and Nicklaus themselves. What happened is that Watson picked up eight strokes on Nicklaus over a stretch of only eight holes, and then Nicklaus picked up four strokes on Watson over a stretch of only two holes. It seemed as if they had separately gone all the way to Albania and back and would somehow wind up in the same place, which was tied for the lead through 54 holes. But Nicklaus completed his round by missing a short putt on the last green. That was the place where Jack really started losing and Tom started winning the tournament. The key hole in the drama of the eight-shot swing on Saturday was the 12th, where Nicklaus, holding only half of the four-shot lead he had forged on Friday, suddenly and quite shockingly hit a six-iron into Rae's Creek and took a double bogey. Rattled, and aware by the noise of the crowd that Watson was probably doing great things ahead of him, Nicklaus hit Rae's Creek again just up the line at 13 for a bogey. Meanwhile, Watson indeed was birdieing 13, 14 and 15 to go four up on Nicklaus. The next key hole of the afternoon was the 17th, where Watson landed in the front bunker and then three-putted for a different type of double bogey, but one as sudden and shocking as Nicklaus'. The result of that, combined with Nicklaus' birdies on 15 and 16, was a four-shot swing. 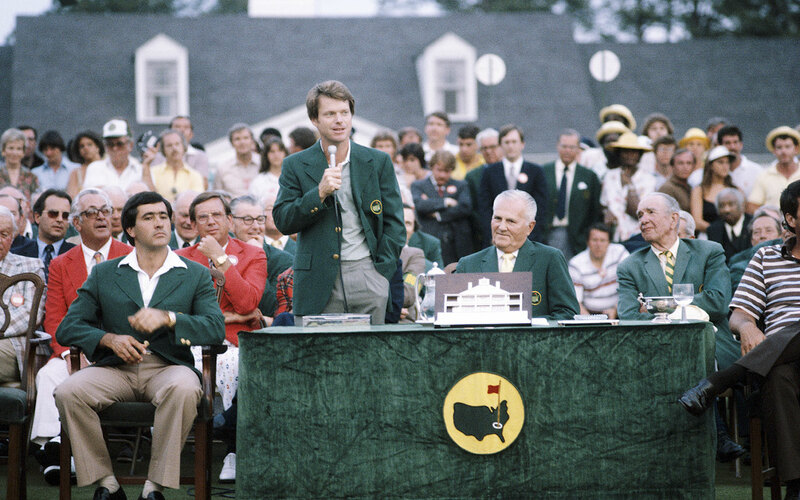 Before Nicklaus and Watson began going for Augusta's throat, agronomy dominated conversation at the Masters, as it often does. This year's scientific discourse focused on the new bent-grass greens, which had been installed over the winter. The subject was especially hot on Thursday, which ended in a four-way tie among Miller, Curtis Strange, Lon Hinkle and an Australian making his Masters debut, Greg Norman. They fired three-under 69s, the highest score to lead an opening round at Augusta in years. As if the reseeded and faster greens were not giving the players enough trouble, the course was even more difficult because several pin placements were "hanging on the cliffs," as Nicklaus put it. These greens will gradually become as fast as Augusta's thin rye greens were in the days of Ben Hogan and Sam Snead and Byron Nelson. While they aren't that swift yet, they were different, and even a veteran like Nicklaus was, in a sense, seeing a new golf course. The putts on every hole were breaking more severely than they ever had before. Putts that once broke six inches were breaking as much as a foot and a half. The short ones were especially treacherous. Nothing could be taken for granted. There were no tap-ins out there and it became common to see a competitor survey a one-footer from four different angles and then stand over the ball like a statue. Nicklaus shot a 70 on Thursday, despite requiring 34 putts. He described the day as probably the best tee-to-green round he had ever played at Augusta—and this from the man who had won the tournament five times. "If I'd putted," said Nicklaus, "I'd be leading by five." The new greens affected play in another way. They caused some shots hit with backspin to kick backward a lot more than the players intended. Golfers saw shots weave off into bunkers and worse. Jerry Pate, playing in an early twosome, arrived at the par-5 15th two under par. The wind had forced him to lay up short of the green in two. He struck what he thought was a beautiful wedge to the pin, which was sitting on the front of the green, on a cliff just above a pond. The ball backed off the putting surface and into the water. Pate, who has a bit of a temper anyhow, was livid. And it did nothing to improve his attitude when he saw Harry Easterly of the USGA, who was officiating at the 15th, go dashing over to the spot where the ball had entered the water and mark the place with a tee. What Pate said to Easterly upon arriving on the scene was, in effect, "Harry, I've played a round of golf before. I know where the damn ball went in, and I know where to drop it. Now get out of my way or I'll throw you in the lake." The least fortunate player on Thursday was Keith Fergus, but what happened to him had nothing to do with the greens. He was sailing along three under par on the 17th hole when he lifted his ball from a gallery crossway, thinking it was ground under repair because it was marked off with white lines. On the PGA tour, crossways are marked off with white lines and you get a free drop. But this is the Masters and local rules, Augusta National's own rules, prevail. An official some distance away had seen Fergus pick up the ball and hit it, and informed Fergus that he'd be penalized a stroke for lifting the ball and two more for not replacing it, for a total of three. "I did the same thing on 8," Fergus volunteered. "That's three more," said the official. "Six in all." "I can add," said Fergus. Fergus took 70 shots—two under—to get around on Thursday, but he scored a 76. Later he would calculate that those six penalty shots cost him a guaranteed invitation to next year's Masters. The first 24 finishers get to come back, no matter what. Fergus finished tied for 37th; without the six-stroke penalty, he'd have come in tied for 19th. Friday was Jack Nicklaus Day. If he had turned an opening-round 65 into a 70 on Thursday because he couldn't putt, he turned about a 74 into a 65 on Friday because he could putt and chip with his Phil Rodgers method, which, as far as esthetics go, produces the image of a man using a post-hole digger. In getting his four-stroke lead on the field through 36 holes, Nicklaus putted on the front nine and chipped on the back. He birdied four holes in a row, the 4th through the 7th, by rolling in putts of one foot, 20 feet, 17 feet and 20 feet, respectively. Suddenly, the new greens were no longer a big mystery or a big story. Then on the back nine, down and around good old Amen Corner, Nicklaus began spraying iron shots all over the place. He had to call on his trusty chipping clubs to get up and down for pars at the 10th, 11th and 12th holes. From where he put himself he deserved three bogeys, but he made pars by chipping close enough to sink the putts. His best chip then came at the par-5 13th, a nasty little shot that had to bump and run, and he put it three feet from the cup for a birdie. In all, he one-putted seven greens on the back side, three of them for birdies. Nicklaus was also the straight man for the biggest press-room laugh on Friday. There were four million typists and broadcasters to greet him in the interview area after his 65. Nicklaus took his seat at the microphone and looked at the crowd with obvious satisfaction and said, "Well, there are a few more people here today than there were yesterday." At which point Art Spander of the San Francisco Examiner said, "We're waiting for Greg Norman." Nicklaus finally laughed, too—after a steely pause. Greg Norman? Well, he had the most colorful hair and background in this Masters, and he was very much in the tournament from start to finish, winding up in fourth place. Norman is a long-hitting Aussie with hair as golden as most surfers', which is what he used to be. He also used to be an Australian rules football player, and he didn't take up golf until he was 17. He is both long off the tee and straight for a big hitter, but his one wild drive into the woods on the 10th hole Sunday cost him a double-bogey 6 and kept him from being an even larger figure in the drama. Norman will be heard from on the U.S. tour. At Augusta, he was this year's foreign celeb, Severiano Ballesteros having been last year's by winning. Seve missed the cut this time along with such other dignitaries as Lee Trevino, Andy Bean, Ed Sneed and Larry Nelson, who was fresh from winning at Greensboro. All Norman missed was a dye job on his hair to tone down the glare. In retrospect, one thing was rather predictable. The new-old Augusta National was playing so tough because of the speedier and more mysterious putting surfaces that it was almost a lock that only a seasoned and multitalented golfer would win the '81 Masters. Except for Norman, familiar names populated the scoreboard all four days, and the two most familiar of all, Watson and Nicklaus, settled the issue with their own private melodrama stretched over a 36-hole stage. Watson thought he won because on Sunday, the day that always counts the most, he never hit two really bad shots in a row. Exactly. After he came off a four-iron and landed in the creek on the 13th, he saved his par despite the penalty shot by deftly laying a wedge shot to within five feet of the cup and staring down the putt. Grace under pressure, they call it. Last Sunday, Watson and grace were lovebirds, strolling hand-in-hand through the Georgia pines. PHOTOPHOTOThe putt at 18 that closed out Watson's triumph may have been short, but his grin was a mile wide.PHOTOAfter a drop at 13 Sunday, a fine chip saved par.PHOTOThough Nicklaus had a round of 65, poor putting one day and two big errors on another frustrated him.PHOTONorman's hopes for conquest were all but drained away by this errant shot at the 10th hole Sunday.PHOTOMiller, at 282, came in second for a third time.PHOTOJack Newton the Aussie who finished in a tie for second in '80, took a tour of the azaleas behind the 13th hole this year and missed the cut by four strokes.